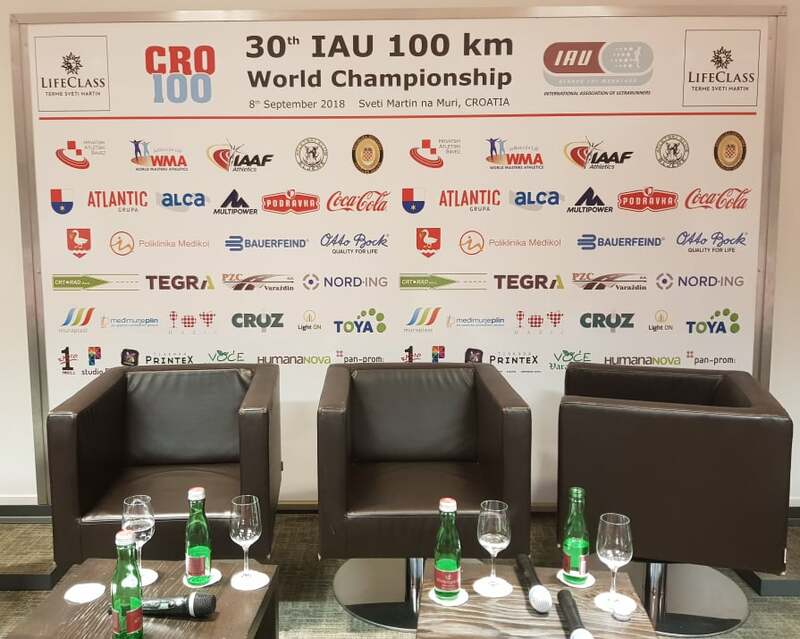 I had a chance to do several interviews on my first day on Sep 6th at the 2018 IAU 100 km World Championship. You can see all of them here. Malgorzata can you please tell us how was your preparation for the Championship and how you see yourself in the competition on Saturday. I am not so sure about my chances on Saturday but I did everything that I could to be ready for this race. All my workouts were done with 100% on my site. I didn’t race for the last 5 weeks and focused on training. It was all, long runs, intervals so I am ready. You had a fantastic run at IAU 24H European Championship early this year where you managed to secure bronze medal individually and gold with the team. Do you think you can do so well here at 100K. This is different race but you have to try and take your chances. Can you tell us how the Polish team looks like. You have 4 men and 3 women on the team. After our briefing I can share that we are all ready. There were some test runs done early this year and all of our team members did well. We are positive and have to do our best. Andre how was the preparation for the Championship. The preparation was very good and the last 8 weeks were fantastic. I had a chance to train on different terrain and I should be ready for the race here. I look forward for Saturday race. Did you do any races early this year. How it was in the long term training. It was not so good. During the Düsseldorf Marathon I got an injury and I had to stop during the race. I did not finished and this injury had as impact on my next training sessions. Finally it was all good and I could be here so I am happy. Your team is always doing well. Can you tell us how you see your teammate for this race. We have very young but strong team. Since I am running for Germany I believe this is the youngest team that we have. I see a great future with them in next few years. I am not sure if we are ready today to fight for the medals but we will do our best and I hope we can be in top 5. Sunil as you are the Team Leader can you please tell us a bit more about your Team coming long way from India. We are a young team in the ultrarunning and this is type of running that is new and growing in India so we are here to gain experience among the best runners from around the world. It will be great exposure and they are looking forward to running with the best athletes. It is fantastic to be here. Few years back you did not have that many ultrarunners now it is growing. Was it difficult to make selection for the National Team. It was not as difficult as you think, we set cut of times for selections and this is how we nominates runners. However in coming years it will be more competitive and we will have more interest and candidates for the Team. Runners are getting better and better and this is only good sign. Just to give you an example how fast its growing. About 3-4 year ago we had a trails race on the southern part with about 100 runners now we will have more than a thousand. You were present for the first time at IAU 24H WC, than IAU Trail WC now IAU 100 km WC. Is this the path that you will follow. You want to make your presents on major IAU events including upcoming continental IAU 24H Championship. Yes, we would like to see more and more runners, get experience and exposure to international level. To learn and see how much we have to improve to world standards. We are not there yet but we will try to improve. It is inspiring to be among the best in the world. It is great that we are having you and your team here as we are one ultra family so all the best for the race on Saturday. Tomas can you share with us how is your Team doing and what is your prediction for the Saturday race. We are 3 men and 3 women in our Team. This is just the minimum to have full team in the competition and unfortunately this is not the strongest team. I have to say that Spartathlon is very popular in Hungary and we not easy job to gather all the best runners. The World Championship is on the same month and this is why we cannot have all our runners here. However for us it is important to be here and this is why we do our best to have a team. We have few athletes that do both 24H and 100 km so they are not as fast as typical 100k runners but they will do as much as they can. I believe we have middle pack team for men. How strong are you ladies. Will you be able to fight for medals. They look good especially Terezia. I think all of them can run similar race and perform well but I am not sure if they can fight for medals. I think sub 8h is possible but we have to wait till Saturday. Jose how did you get where you are now. How was your training for the Championship. It was a long journey for 6 months. It was a hard work for me but I am here and this is great. I manage to run good race in Italy on similar hilly course (100 km del Passatore) so If I can make sun 7:30 it will be great. How many team mates is with you here in Croatia. We are 4 runners here so we will run for both individual and team standing. We are not as strong as other teams but everything is possible so we keep finger-crossed and we will fight for best places. If we are lucky we might get even in medal position. We are only men here but for next championship we might bring some ladies as well. In the end the most important is to complete the race so we do our best to represent our country.